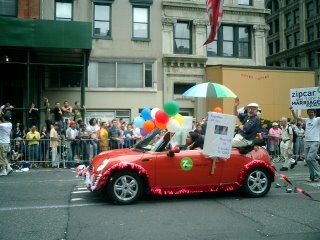 This past Sunday was New York's Gay Pride Parade. (Ok, it's really the Lesbian Gay Bisexual & Transgender parade but who has time for all that.) It's right up there with the St. Patrick's Day parade, the Puerto Rican Day parade, and even the Macy's Thanksgiving Day Parade in terms of the number of people who turn out to enjoy the festive atmosphere and wacky floats, and to show support for their gay friends and family members. The news reports always seem to feature the outrageous drag queens, who are many, but the singing groups, church groups, politicians, motorcycle enthusiasts, PFLAG chapters (parents and friends of lesbians and gays) and sports clubs are even more numerous. Regardless of affiliation, a good time is had by all. It would be interesting to estimate some of the financial aspects of this celebration: the thousands of tourists it brings to the city and how much they spend here, amount spent going to restaurants and parties and clubs, amount spent on rainbow flags, rainbow bracelets, rainbow underwear, mardi gras beads, whistles, etc! But what about the purchasing power of the gay community? A quick Google search turns up this article, which estimates it at $641 billion in 2006. 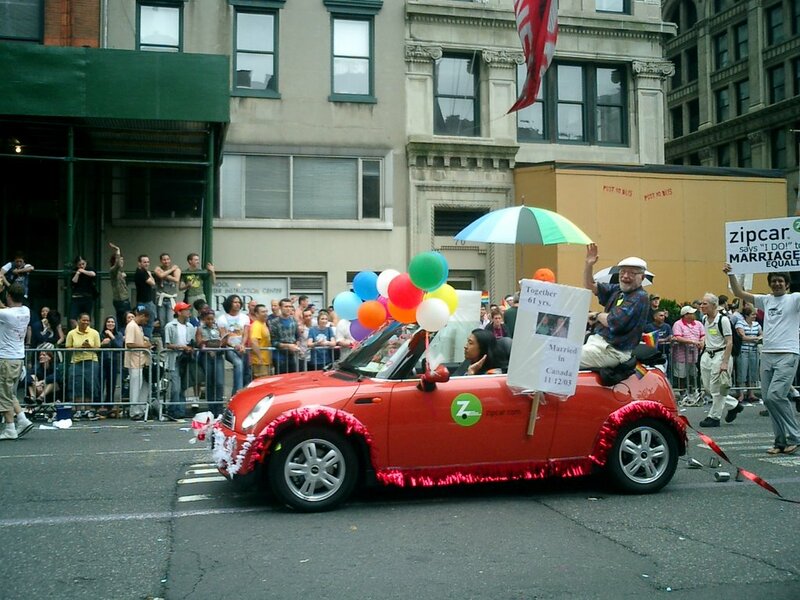 Vying for a piece of that juicy pie, some of the corporate sponsors participating in this year's parade included Mazda, Sirius Satellite Radio, Delta Airlines, Starbucks, Zipcar, L'Oreal, Svedka Vodka, and Bacardi. A perfectly-timed NY Times article titled "Hey Gay Spender, Marketers Spending Time With You" (6/26/06) talks about the transition of gay-targeted marketing from print to TV, the internet, radio and movies, noting that more than 60 mainstream companies have advertised on Viacom's gay and lesbian cable channel Logo, including Anheuser-Busch, eBay, GM, Sony, Sears, Dell, and Orbitz, as well as Subaru, who have been marketing to gays for over a decade. But here is the thing I found really fascinating in this article: when Logo did early research about what their audience was looking for, the viewers "said they wanted to see ads on the channel to see who would be reaching out to them." In today's society, attention from advertisers has become a measure of status, legitimacy, and self-esteem. Interesting, isn't it? It makes sense-- commercials are a huge part of the pop culture we absorb, so of course everyone wants to see themselves represented in that space. So my next question is... are TiVo's sales lower in these minority markets??? One interesting issue you didnt mention was the size of the gay market overall. Regardless of how much gays spend, it matters to consumers only if the overall size of the gay market is significant. Marketers probably know better than scientific researchers. My personal view is that the gay market is a small market, and one that does not need to be individually targeted. My suspicion is that gays will consume at a high rate w/out the heavy advertising, although certain types of ads (such as liquor and cigarette ads) may be able to influence behavior. You asked whether a Subaru could be considered "straight" or "gay", but in fact, Dodge has actually taken to employing anti-gay marketing in its campaign for the Dodge Caliber. (http://pandagon.net/2006/03/31/funny-or-bigoted/) This makes sense to me--trucks, SUVs, etc do seem to me to be more "straight male" cars, whereas cars like the Mini Cooper and Audi TT probably are more favored by gays. I mean, can you really see Keanu Reeves driving around in a Ford F-150? Thanks for letting me reprint this over at Queercents. We love when fine bloggers like yourself produce gay-themed posts! "It's right up there with the St. Patrick's Day parade, the Puerto Rican Day parade, and even the Macy's Thanksgiving Day Parade in terms of the number of people who turn out to enjoy the festive atmosphere"
Thats simply just not true. No, of course it is not equal in attendance to the St. Pat's or Thanksgiving parades, but I would say that the 4 parades mentioned are probably the city's largest and get the most attention (and disrupt as much traffic). Perhaps I should have said the gay pride parade is "rivaled only by" the St. Patrick's Day, Thanksgiving, and Puerto Rican Day parades to be more accurate. I pasted Nina's time stamp by mistake. "Perhaps I should have said the gay pride parade is "rivaled only by" the St. Patrick's Day, Thanksgiving, and Puerto Rican Day parades to be more accurate." Again, wrong. The largest NYC parade, in terms of attendance, is the West Indian Parade. 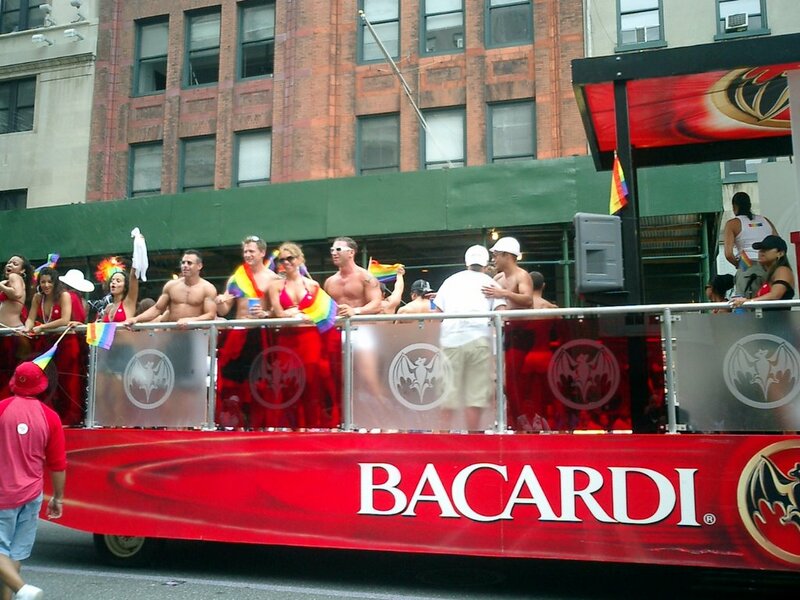 The "gay pride" parade has nowhere near the attendance of any of the major ethnic nyc parades. The gay halloween parade has a higher attendance than the gay pride parade. I hate to correct you but you are wrong here. And I am not eager to minimize it, its just that you all seem eager to maximize it. Why does it irk you so much that readers on this blog may be "eager to maximize" the gay pride parade? Ya gotta admit - it's fabulous! Are you always this easily irked, or are you particularly sensitive to issues involving the quantification of gay people? and madame x-- do you honestly NOT know how gay Subaru really is?